GREENVILLE, S.C. (BRAIN) — Retailer Robin Bylenga opened Pedal Chic in 2010 to cater to female cyclists. In February, Bylenga moved the store into a larger space on the bike path in downtown Greenville, about two and half blocks from Pedal Chic's previous location. Amended transportation bill is headed to governor's desk. SALEM, Ore. (BRAIN) — In the name of simplification, Oregon's Legislature this weekend amended the state's $15 bicycle excise tax to include all bikes selling for $200 or more, including e-bikes. The tax originally exempted bikes with wheels smaller than 26 inches and exempted e-bikes that were sold through bike shops. SEATTLE (BRAIN) — REI, like its Canadian co-op cohort MEC has decided to suspend orders of Vista Outdoor products because of the company's connection to the firearms industry. 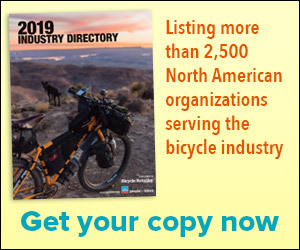 REI sells Vista's Giro, Bell, CamelBak, Camp Chef and Blackburn brands. BEDFORD, Pa. (BRAIN) — Fat Jimmy’s Outfitters and Olde Bedford Brewing Company are teaming up to offer bikes, boats and beer to customers in the Bedford County area. DURANGO, Colo. (BRAIN) — Longtime retailer David Howard is back in the bike business again following a 12-year hiatus. ARLINGTON, Va. (BRAIN) — Jim Strang, president of Spokes Etc., hopes to re-open the recently shuttered Arlington location of Freshbikes by end of March. The store will expand the Northern Virginia chain to six locations. Strang said Spokes Etc. will take over the lease. The store is fully built out so move in should be easy. FOUNTAIN VALLEY, Calif. (BRAIN) — Pedego announced that a new store has opened in Fort Myers, Florida. The store is co-owned and operated by husband and wife Skip and Lisa Badolato, who left their Wall Street jobs after 30 years and moved to open Pedego’s 116th store. SANTA CRUZ, Calif. (BRAIN) — Santa Cruz Bicycles has launched a new online education program, The Manual, to help dealers and retail staff sell and service the company’s Santa Cruz and Juliana bike line and Reserve wheel line more effectively. Company aims to open 25 locations in the next 18 months. DENVILLE, N.J. (BRAIN) — Voltaire Cycles Inc., the franchising arm of retailer Electric Spokes Company, has opened its first e-mobility franchise in Denville, New Jersey. The 2,700-square-foot showroom features e-bikes and electric scooters and skateboards. SAN CARLOS, Calif. (BRAIN) — Mobile bike shop franchiser Beeline Bikes has expanded into the Detroit market in partnership with retailer American Cycle and Fitness. SALT LAKE CITY (BRAIN) — A U.S. District Court judge has dismissed a suit filed by Moab retailer Poison Spider Bicycles against a company that sells merchandise under the Poison Spyder Customs brand. BOULDER, Colo. (BRAIN) — Boulder retailer Full Cycle, which added an espresso bar and beer tap area to its Pearl Street location last year, has now given that part of its business its own name: The Tune Up. OLDSMAR, Fla. (BRAIN) — Florida retailer BikeSport recently celebrated its grand reopening as a Giant Partner Store. SAN CARLOS, Calif. (BRAIN) — Jason Boles, who owns The Velo bike shop in Phoenix, Arizona, has launched a Beeline Bikes mobile repair franchise in Los Angeles. Boles also has signed franchise development agreements with Beeline in other regions of Arizona and California. Major brands including Shimano, SRAM, QBP and Canyon attend the mobile service franchiser's expo in Nevada. LAS VEGAS (BRAIN) — Mobile bike franchiser Velofix held a stationary “mini-trade show” here last week, with about 110 franchise owners and operators holding their annual meeting. NEWARK, Del. (BRAIN) — Former employees of longtime retailer Wooden Wheels, which shut down recently, have started a crowdfunding campaign to raise funds to open a new shop in the Newark area. ALEXANDRIA, Va. (BRAIN) — Freshbikes, a Washington, D.C.-area retail chain, announced Monday that it was shutting down. WILLARD, Mo. (BRAIN) — Matt and Cari Harrison were looking for a way to build a small bike shop next to the popular 36-mile Frisco Highline Trail, on a piece of land leased from the rail trail's owner, the Ozark Greenways corporation.